Last week saw the passing of two blues icons, Etta James and Johnny Otis. Without one, we might never have heard of the other. 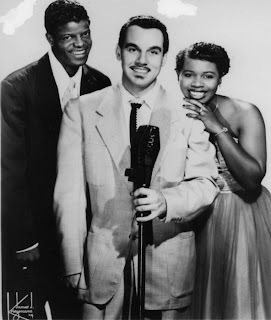 Both made an indeliable impact on the music and while most current blues fans were definitely familiar with Ms. James, Johnny Otis might not be as familiar a name, but his impact as the "Godfather of Rhythm and Blues" was even greater. Johnny Otis was born Ioannis Alexandros Veliotes in 1921. He was the son of Greek immigrants, but opted to live his personal and professional life as an African-American because of his love for R&B and jazz. He changed his name to Otis as a teen and developed a passion for the drums, playing in a number of swing bands. In 1945, he formed his own band, and had one of the year's, and the genre's, biggest hits, "Harlem Nocturne." 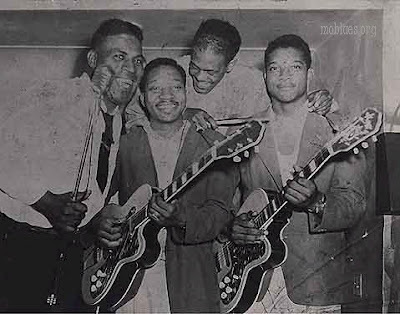 The band also played with Wynonie Harris and Charles Brown (as part of Johnny Moore's 3 Blazers). He played on Brown's "Drifting Blues," and Johnny Ace's "Pledging My Love." He also opened a nightclub during that time, the Barrelhouse Club, in Watts, and his interests moved more toward Rhythm & Blues. Over time, Otis reduced his band's size and began recruiting singers. Among his discoveries were sax man Big Jay McNeely, the vocal group, the Robins (who later became the Coasters), Mel Walker, and the teenage singer Little Esther Phillips, who won one of the Barrelhouse's talent shows. 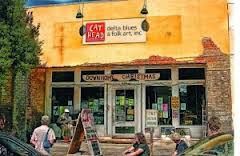 That band became known as the California Rhythm & Blues Caravan and enjoyed a lot of success for the rest of the 1940's. Otis had TEN Top 10 hits in 1949. He also expanded his musical repertoire to include piano and vibraphone. After 1950, Otis' own impact on the charts began to decrease, but his band continued to back some successful musicians (including Big Mama Thornton on her hit, "Hound Dog") and he became a highly successful talent scout, discovering legendary acts like Jackie Wilson, Hank Ballard, Little Willie John....and Etta James. James was born Jamesetta Hawkins in 1938. Her mother was 14 years old at the time and James never knew her father, but she speculated that it might be the pool player Minnesota Fats. Her mother was rarely around either, so she was raised by several different people, including her grandparents, who took her to church regularly. At the age of five, she became a soloist with the choir and even appeared with them on several radio shows. When she was twelve, she ended up living with her mother in San Francisco, with little adult supervision, and started getting into trouble. Still, her love for music prevailed and, with two of her friends, she formed a group called the Creolettes. 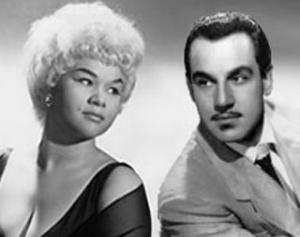 It was during this time that Jamesetta Hawkins crossed paths with Johnny Otis. 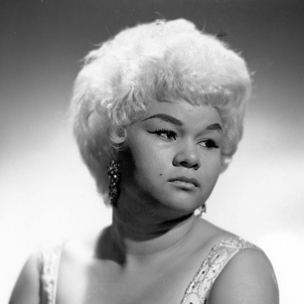 Stories vary on how the two actually met, but Otis took the group under his wing, changing Jamesetta's name to Etta James and the group to the Peaches, and got them a deal with Modern Records, where they recorded "Roll With Me, Henry," an answer song to Hank Ballard's "Work With Me, Annie." The song was later released as "Dance With Me, Henry," due to the suggestiveness of the original title. The song hit #1 on the R&B chart, but was quickly covered by pop singer Georgia Gibbs, under the title "The Wallflower." Gibbs' version hit #1 on the Billboard Hot 100, which infuriated James. James left the Peaches soon after and eventually signed with Chess Records. Leonard Chess envisioned James as a potential pop sensation and loaded her songs up with strings. Many of her early hits followed this pattern, including her signature song, "At Last," but she also recorded numerous blues, R&B, jazz, and doo-wop songs along the way. Some of her other hits during this time were "I Just Want To Make Love To You," "Sunday Kind of Love," and "Something's Got A Hold On Me." After a brief absence from the charts, James returned with an R&B focus that resulted in two of her biggest hits, "Tell Mama" and "I'd Rather Go Blind." She continued to record with Chess until the late 70's, branching out into rock and funk on several of her later recordings. During this time, she struggled with drug addiction and alcoholism and basically dropped off the scene for nearly a decade. Though she continued to perform in clubs as she battled her addictions, James resurfaced for all to see in the late 80's, as part of the Chuck Berry documentary, Hail! Hail! Rock 'n' Roll, where she performed "Rock & Roll Music," with Berry (James contributed backing vocals to several of Berry's Chess sides). Soon, she signed a record deal with Island Records, and enjoyed a long string of successful recordings, mixing pop, jazz, the blues, and R&B. 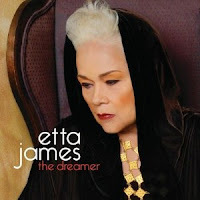 She also found time to release her autobiography, Rage To Survive (co-written by David Ritz), and received a boatload of honors, including induction into the Blues Hall of Fame, the Rock & Roll Hall of Fame, a Lifetime Achievement Grammy, and even induction into the Rockabilly Hall of Fame. During James' run, Johnny Otis continued to enjoy success as a songwriter and producer. In 1958, he had a hit with "Willie and the Hand Jive," which has been covered by Eric Clapton, George Thorogood, and at least a million other artists. By this time, Otis was clearly established as a pioneer not only in blues and R&B, but also rock and roll. He continued performing off and on, occasionally performing with his son, guitarist Shuggie (who wrote and sang "Strawberry Letter 23," later a Pop and R&B hit for the Brothers Johnson in the late 70's). Otis also worked in journalism, tried his hand at politics, became a pastor, owned a health food emporium, and hosted a longtime radio program in the San Francisco area. He was inducted into the Rock & Roll Hall of Fame in 1994. He continued performing and recording well into the last decade, with Shuggie on guitar, son Nick on drums, and a couple of grandsons who also played guitar. Otis passed away on January 17 at the age of 90. 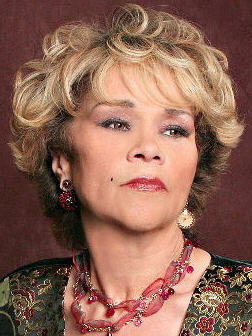 Etta James' last public appearance was in 2010, as she had to cancel her tour due to failing health. It was revealed that she was suffering from leukemia and dementia. Her final recording, The Dreamer, was recorded in 2009, but released this past November to critical acclaim. James passed away on January 20, five days shy of her 74th birthday. 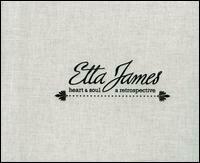 Etta James leaves behind a huge fan base, many of whom only found out about her in recent years and have backtracked to discover her incredible early body of work. 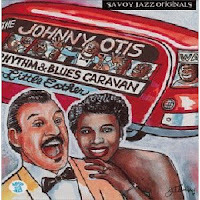 However, Johnny Otis, the man who started her on her path, though largely working behind the scenes since the 1960's, had an even bigger impact on the early development of modern blues and rock & roll. 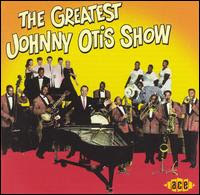 The Greatest Johnny Otis Show (ACE) - 26 of Johnny Otis' mid to late 50's recordings for Capitol. This set includes two of his biggest hits ("Willie and the Hand Jive," "Crazy Country Hop"). Features Mel Walker, Marie Adams, guitarist Jimmy Nolen (future James Brown guitarist), Three Tons of Joy (see above), Jeannie Sterling, and Jackie Kelso. The Johnny Otis Rhythm & Blues Caravan (Savoy Jazz) - This is a three-disc set (77 tracks) covering Otis' early years from 1949 - 1951. This was Otis' most successful period on the R&B charts and there's lots to enjoy for fans of early R&B. It features Walker and Little Esther Phillips on vocals. 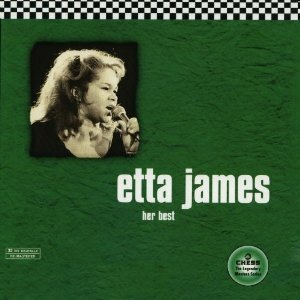 Her Best (Geffen) - 20 of James' classic sides for Chess from the 60's and 70's. Pretty much everything you need is right here.....all the hits and should-have-been-hits. People who want to hear more of the Chess years can opt for the Chess Box, a three-disc set. 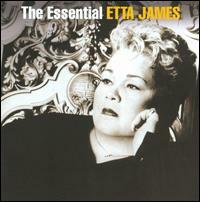 The Essential Etta James (Sony) - This is a pretty complete set of James' best moments from the past twenty years. Unfortunately, she got next to no radio play over that time, due to the crappy situation that passes for modern radio during that time, which is sad because she had some really great recordings in that time span. Heart & Soul: A Retrospective (Hip-O Select) - A comprehensive set that covers James' career from "The Wallflower" in 1955 to 2008. This four disc set is really for the die-hard fans, but you can rest assured there's some great music on it from start to finish. The Dreamer (Verve Forecast) - James' final disc finds her singing in a lower register than usual, but still as effective as ever. Though she was battling numerous health problems during this time (2009), she definitely showed she was going out on a high note with this effort. 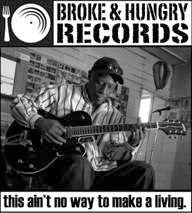 When I first started listening to the blues, I started receiving a catalog from Roundup Records in Cambridge, MA. As I stated a few months ago, I found an ad in a Jazz Fest program for Roundup and mailed a request (remember those days) for a catalog. When it came in the mail, it was almost overwhelming. The number of recordings available was staggering. I didn't know where to start, so I would try to order three or four at a time. I was getting cassettes at the time, which made my choices a little easier since most of their stock (particularly the ones I'd heard of and wanted to buy) was either available on LP or CD (the story of my life). About a year into collecting, I saw one particular album called Blues Around Midnight that featured songs by B.B. 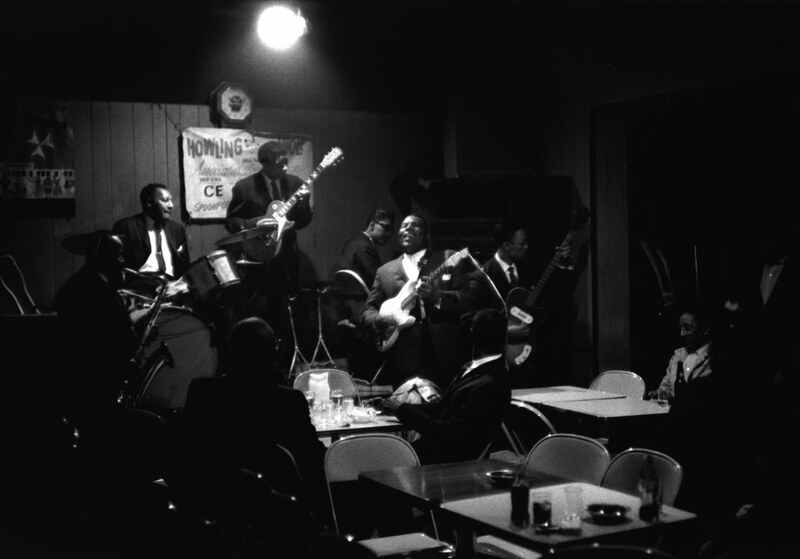 King, Ray Charles, T-Bone Walker, and Johnny Copeland. It looked like mostly after-hours blues, maybe on the jazzy side, so I decided to order it, along with a few others. Talk about a worthwhile purchase. Not only were the above mentioned artists there, but many others that I'd never heard of, but liked just as much. I've always been a sucker for anthologies because they feature so many different artists and a variety of tunes. Even though many of these are usually budget collections, they almost always end up costing me more money because I have to track down releases from the previously unknown artists that I hear on them. One of the first posts I did on Friday Blues Fix was about Larry Davis, who was one of those most under-appreciated blues singers ever. Davis was a triple threat talent....a wonderful singer in the B.B. 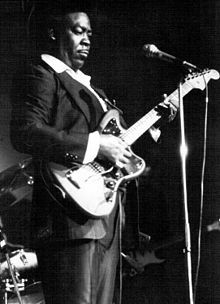 King tradition, a strong guitarist in the Albert King tradition, and also a talented songwriter (composer of "Texas Flood," among others). However, he was injured in a motorcycle accident just as his career was gaining momentum in the early 70's and was unable to perform for a few years. Although he did record a couple of excellent albums in the 80's, they were few and far between. 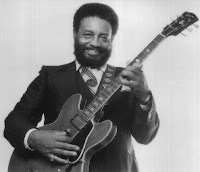 When he finally did get a big break, recording for Rounder's Bullseye Blues label in the early 90's, he was unable to fully enjoy it because he died from cancer in 1994. Davis had two tracks on Blues Around Midnight, including his impressive version of B.B. King's "Three O'Clock In The Morning," which opened the disc. Johnny Copeland was a few years away from his success with Rounder Records when he cut "Old Man Blues," with backing from the Jazz Crusaders, better known by many jazz fans after they dropped the "Jazz" from their names and became known as The Crusaders. The Crusaders, who ruled the Jazz air waves in the 70's with their soulful take on jazz, got their start as high school students in Houston, which is where Copeland hung his hat as well. Copeland, of course, went on to greater success with Rounder, then later as part of the Showdown! 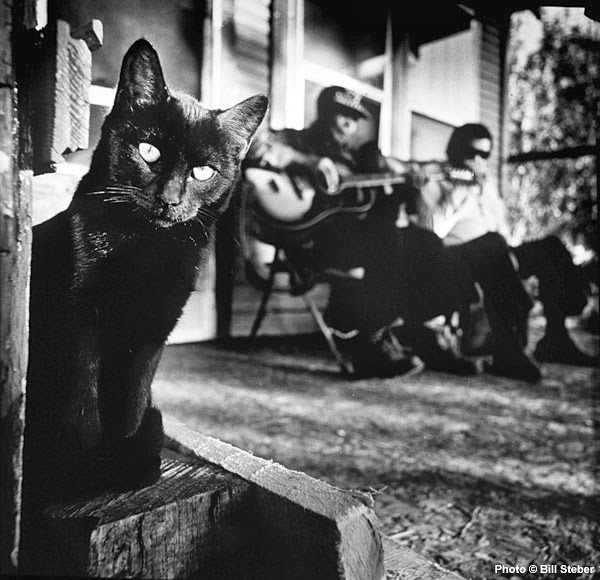 collaboration with Albert Collins and Robert Cray, then finally cutting a few albums with Verve before passing away after complications from heart surgery in 1997. Oklahoma native Lowell Fulson recorded the title track and was also the author of several other memorable blues standards, including "Reconsider Baby" (made famous by Elvis Presley), "Sinner's Prayer" (later done by Ray Charles), and "Tramp" (later covered by Otis Redding). He also recorded definitive versions of "Blue Shadows," 'Every Day I Have The Blues," and "Black Nights." 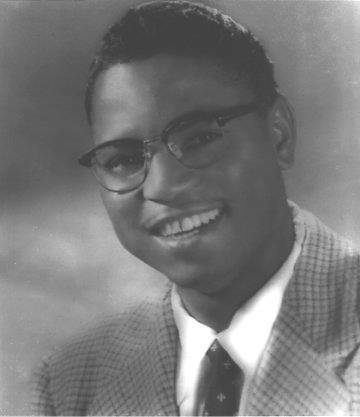 Fulson continued to perform and record regularly until the late 90's, when his health began to fail and he passed away in 1999, after a successful five-decade career. ﻿﻿Jimmy Nelson was a star for a very short time. He recorded the song, "T-99 Blues," which became a chart-topper in 1951 for RPM Records. He never reached those lofty heights again, but recorded some quality material during his lifetime for other labels, like Chess and Music City. 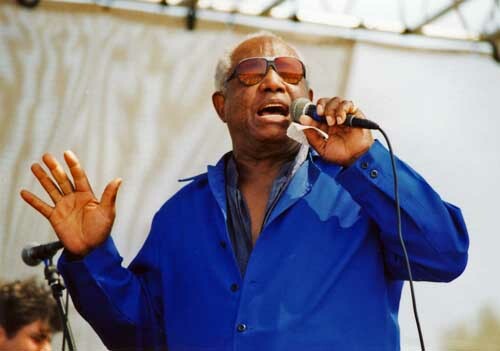 He resurfaced in the late 90's with a fine recording for Bullseye Blues and continued to perform up until shortly before he passed away in 2007 at age 88. 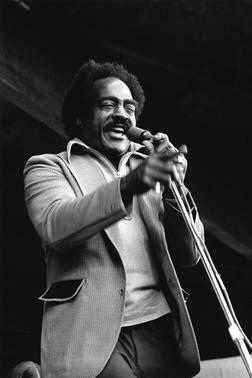 Jimmy Witherspoon is showcased on two tracks, including "Gee, Baby, Ain't I Good To You." Witherspoon is considered one of the greatest of the post-war blues singers, but he was as comfortable singing jazz as he was the blues. He started recording with Jay McShann's band in the mid 40's and his first big hit was the classic "Ain't Nobody's Business." By the time the mid 50's rolled along, 'Spoon's brand of shouting blues was out of vogue, though he continued to record some great music for various labels, but got back on the map with a wonderful jazz recording in the late 50's from the Monterey Jazz Festival. 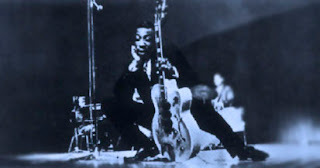 He also cut his finest record, "Evening Blues," with T-Bone Walker backing him on guitar in the early 60's. He briefly retired from performing, but continued to record and worked as a DJ. He later returned to performing and recorded several albums with artists like Eric Burdon and Robben Ford. He contracted throat cancer in the 80's, which affected that powerful voice, but he continued to perform until his death in 1997 at 77. 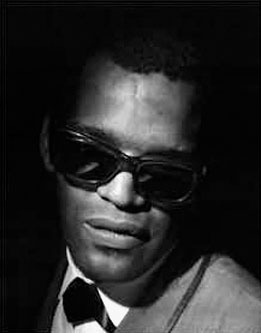 ﻿﻿﻿﻿﻿﻿﻿﻿﻿﻿Ray Charles cut "I'm Wonderin' and Wonderin'" in the early 50's, just before he hit it big with Atlantic. In his early recordings, Charles was heavily influenced by Charles Brown, but on this track, while the Brown influence can still be heard musically, you can hear him slowly developing his own distinct style, especially on vocals. From this point, the young singer progressed quickly, single-handedly (some say) creating soul music during his tenure with Atlantic, then making an amazing transition toward country in the 60's, then developing into a music legend from that point on. On Blues Around Midnight, you get a glimpse of the early Ray Charles. Since Blues Around Midnight contains tracks from Kent, Modern, and other labels, it's only natural that B.B. King should appear, since he spent many years during the 50's with Kent and RPM Records. He gets a great pair of tunes on this set. For my money, one of the greatest guitar solos ever kicks off "You're Breaking My Heart." Your feelings may differ, but the opening thirty seconds or so still give me chill bumps some twenty-five years after hearing it for the first time. I think every blues fan has a favorite B.B. King song and this one is mine. Though King has had a lot of great years since, I have always thought that some of his best output was during those wonderfully productive years in the 50's and early 60's. The set also features a previously unreleased track from T-Bone Walker from his nomadic period in the 60's, when he hopped from label to label. As you can hear, though Walker had problems finding a permanent home after successful long term label associations in the 40's and 50's, the quality of his music was still first-rate. Unfortunately, the times had changed and his style of blues was no longer as popular. "Love Will Lead You Right" is as strong as anything he ever released and would have been a hit in a perfect world. There are many other great tracks too, including a pair of songs from Frankie Ervin, who replaced Charles Brown in Johnny Moore's 3 Blazers. Ervin's two tracks were the amusing "Dragnet Blues" (which drew the ire of Jack Webb, who sought a restraining order and wrecked the song's momentum on the charts) and the witty "Playing the Numbers." Ervin had a star-crossed career in the 50's, serving as lead vocalist with the Shields after he left Moore. He resurfaced in the 80's and 90's for a time, passing away in 2009 at the age of 84. Ace Records has released many quality recordings from many genres of music for a long time. There have been some fantastic compilations during that time. Their recordings are highlighted by outstanding sound and some of the best liner notes you'll ever read, with loads of information about the featured artists from some of Britain's foremost blues scholars. 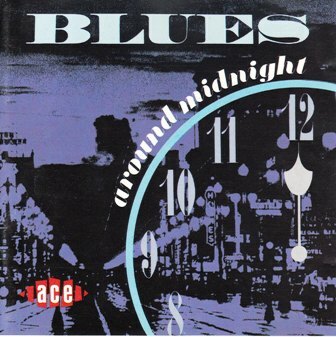 For blues fans who enjoy the late-night, after-hours, jazzy urban blues from the 50's and 60's, you won't find a better collection than Blues Around Midnight. Unfortunately, it's out of print, but copies can still be found at various music sites, including a few listed in the links on the right sidebar. I wonder what went through Sam Phillips' mind when he saw Howlin' Wolf walk into his Memphis recording studio back in 1950. I mean, he had heard Wolf on his radio show, and he had probably even seen him before, but walking through the door toward him, standing 6' 3" and nearly 300 pounds, the Wolf had to be quite an imposing, and imtimidating sight. Whatever Phillips thought when he saw the Wolf probably couldn't hold a candle to whatever he thought when he heard him behind the microphone, as he snarled his vocals and breathed fire through his harmonica. Howlin' Wolf was the blues' version of Mr. Hyde. He was the music at its most raw and primal. He had the rare ability to rock his listeners to their knees and scare the devil out of them at the same time. I can remember that series of Raeburn Flerlage photos of him in action at Sylvio's, and how he seemed to glide across that postage stamp of a stage like a man half his size, with an almost childlike pleasure at being able to do what he was doing....perform for his audience, who were probably watching in wonder, mixed with a little fear, trying to figure out what he was going to do next. 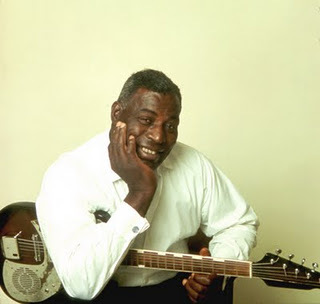 Howlin' Wolf was born Chester Arthur Burnett near West Point, MS in June, 1910. His parents split up when he was young and his mother threw him out of the house when he was still a child because he wouldn't work around the farm, so he lived with his uncle for awhile. After his uncle treated him badly, he ran away and found his father, where he ended up living happily. Wolf's father was a farmer and for a while, it appeared that the son might follow in the dad's footsteps. However, his path crossed that of Delta blues legend Charley Patton and everything changed. Every night, he would listen to Patton play outside of a local juke joint. From this experience, the Wolf was able to pick up on Patton's inimitable growl and his showmanship. He learned harmonica from Rice Miller (Sonny Boy Williamson II), who had married Wolf's half-sister. Miller taught him the basics of harmonica and by the early 30's, Wolf was performing, mostly as a Patton imitator, but he was also influenced by other artists at the time, such as Tampa Red, Blind Lemon Jefferson, Tommy Johnson, Blind Blake, Ma Rainey, and country music star Jimmie Rodgers. Wolf tried to emulate Rodgers' famous "blue yodel," but it came out sounding more like a growl or howl. 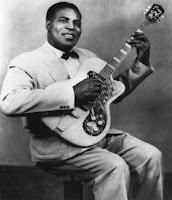 Wolf continued throughout the 30's, performing solo and performing with others, like Honeyboy Edwards, Floyd Jones, Johnny Shines, Robert Lockwood Jr., Son House, and even Robert Johnson. In 1941, he was inducted into the Army, but was discharged in 1943, without ever going overseas, because he found the adjustment to Army life too challenging. He returned to farming with his family around West Memphis, Arkansas, while continuing to perform on the weekends. 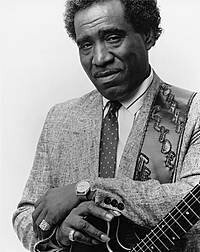 By 1948, he had formed a band with guitarists Matt "Guitar" Murphy (who helped Wolf improve his guitar playing) and Willie Johnson and a piano man remembered only by the name, "Destruction." Wolf hosted a 15-minute radio show at KWEM in West Memphis, where he promoted his appearances, sold farm equipment and gave farm reports. By now, his band's sound was expanding to include electric instruments and Willie Johnson's highly combustible guitar style complemented Wolf perfectly. In 1950, his radio show was heard by Sam Phillips, who eventually recorded Wolf in his Sun Records studio. These recordings, which captured Wolf's raw urgency and passion nearly perfectly, were sold to TWO record labels....the Bihari brothers' RPM Records in California and Chess Records in Chicago. He had two hits at the same time on two record labels, who were now fighting over him. Wolf ended up with Chess Records and made the permanent move to the Windy City. 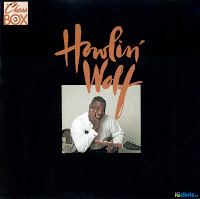 Wolf's next recording session for Chess had more of an urban Chicago sound that his previous recordings, in part due to the addition of Hubert Sumlin's guitar to the band. Sumlin started out as a rhythm guitarist, but gradually became as big a part of the Wolf's sound as the Wolf himself. His guitar style can best be summed up as unorthodox....he rarely played chords, skittering terse, stinging notes all over the place, sometimes even over Wolf's vocals. Other than a brief stint in Muddy Waters' band in the mid 50's, Sumlim remained a vital part of the Wolf's band for the duration. The Wolf enjoyed a large amount of success in the 50's, charting with four of his songs ("How Many More Years," "Moanin' At Midnight," both from his early recordings, the immortal "Smokestack Lightning," and the ominous "I Asked For Water (She Gave Me Gasoline)"). 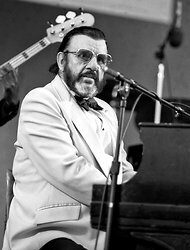 As he moved into the 60's, Wolf enjoyed success with "The Red Rooster," "Evil," "Spoonful" (a variation of an old Charley Patton tune), "Back Door Man," "Wang Dang Doodle," and "I Ain't Superstitious." Many of these tunes were written by Willie Dixon, who teamed up with Wolf in the late 50's/early 60's and gave the bluesman's career a bit of a boost. 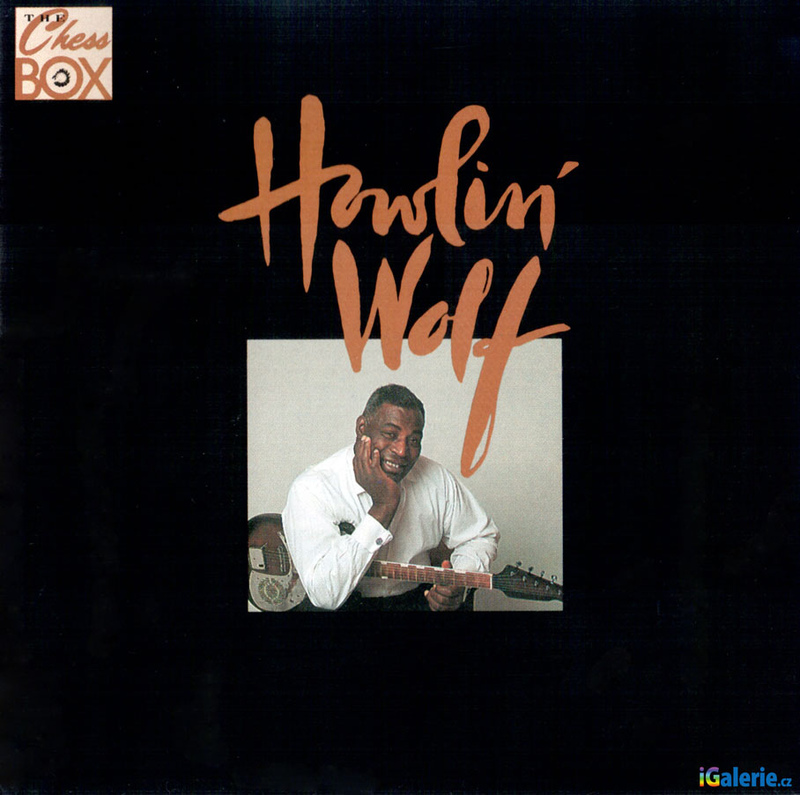 From the 60's onward, Wolf mostly recorded Dixon songs, many of which became standards over the years and were covered by many different rock bands of the 60's, notably Cream, Jeff Beck, the Doors, and the Rolling Stones, whose version of "The Red Rooster" went to #1 in England. Also during this time, the Wolf took part in the American Folk Blues Festival tour in Europe in 1964 and also appeared on the TV show Shindig! The Rolling Stones had come to America to appear on the show and one of their stipulations for appearing was that Howlin' Wolf had to appear as their special guest. He did and, with the Stones sitting at his feet and millions watching on TV, blew the place apart with a scorching version of "How Many More Years." Over the years, Wolf enjoyed a long-running, but generally friendly rivalry with Muddy Waters. 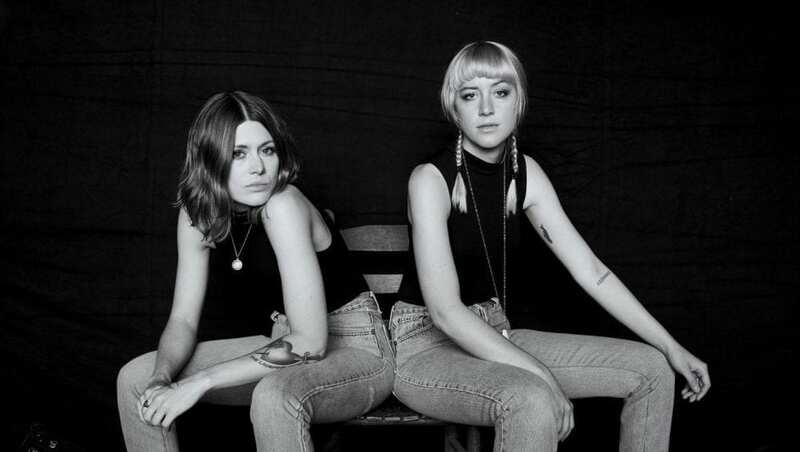 Waters helped Wolf get work when Wolf arrived in Chicago and they actually shared a grudging admiration for each other. 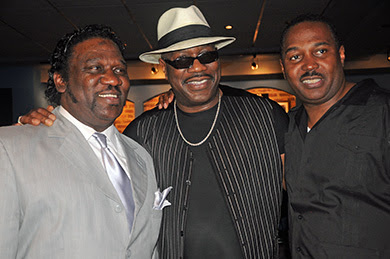 Wolf did pull little stunts occasionally, like stretching out his set at the Ann Arbor Blues Festival in 1969 to prevent Waters from coming onstage, and Waters did recruit Sumlin into his own band briefly when Wolf and Sumlin were at odds. One of the last classic tunes the Wolf did was one of his own compositions, the wondrous "Killing Floor." Sumlin unleashed one of his most memorable guitar riffs and the Wolf's throat-shredding vocal made this one a keeper. This song was later covered by Jimi Hendrix and Led Zeppelin (who actually claimed composer credits). 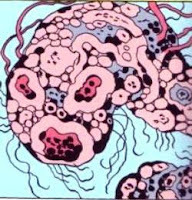 The late 60's were an interesting time for Wolf. Observing that many of the new rock bands were recording his old songs, Chess tried to "update" his sound by making a psychedelic album (which Wolf later described as dog excrement). In 1970, he and Sumlin went to England to record a session with Eric Clapton, Bill Wyman, Steve Winwood and others. 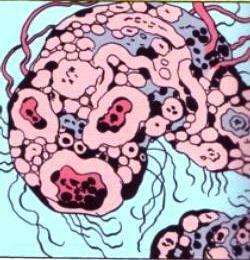 As the 70's progressed, the Wolf's health regressed. He suffered several heart attacks and was in a car accident which sent him flying through the windshield and caused permanent damage to his kidneys. Bandleader and sax player Eddie Shaw began rationing his songs to about six per show and he had to schedule his appearances in proximity to V.A. hospitals, so he could receive dialysis. He died in one of the V.A. hospitals in Illinois after surgery on January 10, 1976. Wolf's legacy continues to this day. 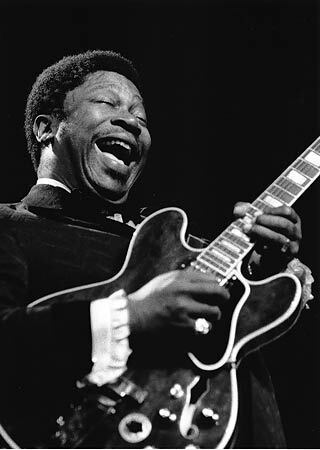 If you watch sports of any kind on TV, you will hear "Smokestack Lightnin'" at least fifteen times on Viagra commercials during any televised sporting event, but his real legacy is the fact that blues acts still perform his songs, singers try to emulate him, and performers still try to match his stage presence all over the world. 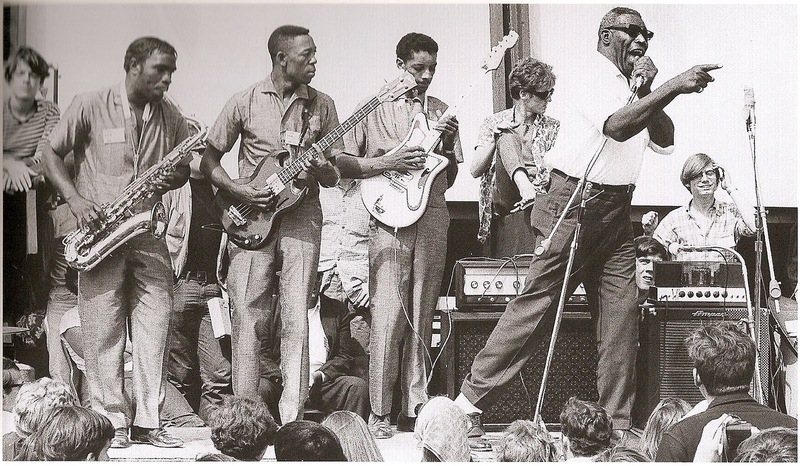 They try, but no one has ever come close to matching Howlin' Wolf' on stage or recording. I realize that these albums have been re-repackaged in recent years, putting a different cover and title on the same collections of songs (don't even get me started on this practice), but these are the formats in which I listened to these tunes on CD. My first exposure to Howlin' Wolf was on the cassette collections that MCA released in the mid 80's (His Greatest Sides, Vol. 1 and as part of the wonderful five-volume The Blues series) that are sadly no longer in print. 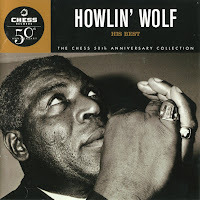 There's also an excellent biography, written by James Segrest and Mark Hoffman, and a very good DVD that was released seven or eight years ago, if you want to find out even more about Howlin' Wolf. The Chess Box (MCA/Chess) - A three-disc set that is really all you can ever ask for. One disc full of the Memphis tracks and his early Chicago sides, one disc with the bulk of his 50's hits, and one disc that wraps up with his 60's classics. There's also a couple of cuts from an interview in 1968. This set pretty much has all the Wolf that anyone would ever need. His Best, Volume 1 and Volume 2 (MCA/Chess) - These two are a good place to get started with Howlin' Wolf. Volume 1 features 20 of his greatest sides, pretty much all a casual fan could ask for, but Volume 2 features many of his lesser-known, but equally excellent sides spanning his years with Chess. Actually, these two discs provide a pretty complete look at the Wolf and cover the bulk of the box set at a much lower price. 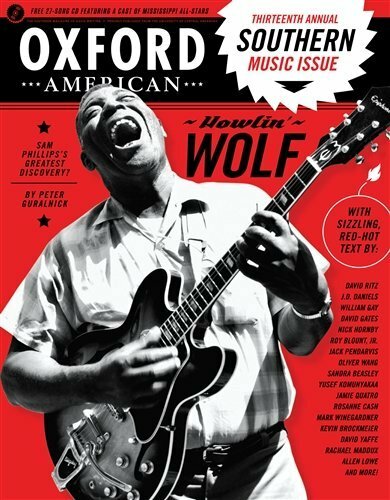 The annual Music issue of the Oxford American is now available. 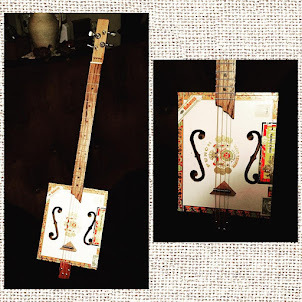 This issue is always a favorite because a CD is included with the magazine that usually features some outstanding, sometimes hard-to-find music from the region's finest musical talent. Over the past three years, the OA has used the Music issue to focus on the music from a particular southern state....the first two being Arkansas (where the magazine is published) and Alabama. The accompanying CD usually showcases lesser-known singers and groups along with somewhat obscure tracks from more familiar artists. There's nothing wrong with that because this policy opens everybody's ears to some great music that they might have missed otherwise. In addition, there are some fantastic articles related to the music by some of the finest writers. This year's issue focuses on the music of Mississippi, so naturally there's an abundance of blues present. Peter Guralnick (currently working on a biography of Sam Phillips) has an excellent article on Howlin' Wolf and how he might have been Phillips' greatest discovery of all. There are also articles about other Mississippi natives, like a short bio of the highly underrated Guitar Slim (a Greenville native), the many career ups and downs of soul/blues legend Syl Johnson, Bo Diddley, and the troubled street musician Ted Hawkins. 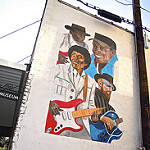 There are several other articles about Mississippi blues in general, but other genres are highlighted as well, especially rockabilly and rhythm & blues. 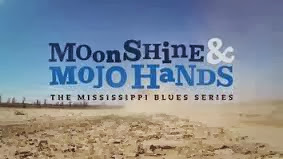 I've always been amazed at the sheer volume of musicians that were born in the Magnolia State in every genre imaginable from blues to jazz to rock to country to R&B......not just musicians, but pioneers in their respective genres. As I mentioned above, this is Friday Blues Fix's 100th Post (cue trumpets). In a few weeks, we will be celebrating our 2nd anniversary online. Thanks to everyone who stops by and checks us out on a regular basis. 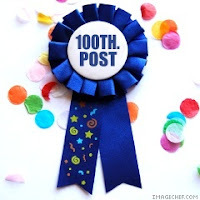 I was planning on a bigger post, but the virus hit....and hit again, so things didn't work out. Instead, here's a couple of videos I found on YouTube during the holidays. Lil' Ed & the Blues Imperials was one of the first bands I discovered when I started listening to the blues, courtesy of Alligator's The New Bluebloods collection, then their fantastic debut CD that they ended up recording while putting their song together for the Bluebloods anthology. They were also one of the first live bands I got to see back in the late 80's, and they just blew everyone away. This is from a Blues Cruise from a few years back, and as you can see, they are still a lot of fun. Check out young Andy Poxon. 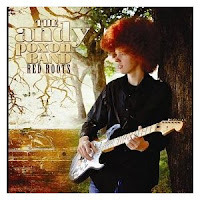 The 16 year old just released his debut recording, Red Roots, which I highly recommend. Teenage blues guitarists seem to pop up on every corner these days, but Poxon really sounds like he's got the goods and the staying power. He writes nearly all of his own material (seemingly from his own perspective, which is refreshing) and has a highly diversified style in his writing, singing, and playing, which should appeal to blues and blues/rock fans. Plus, he sports the coolest afro since Phil Guy. Do yourself a favor and check this guy out.